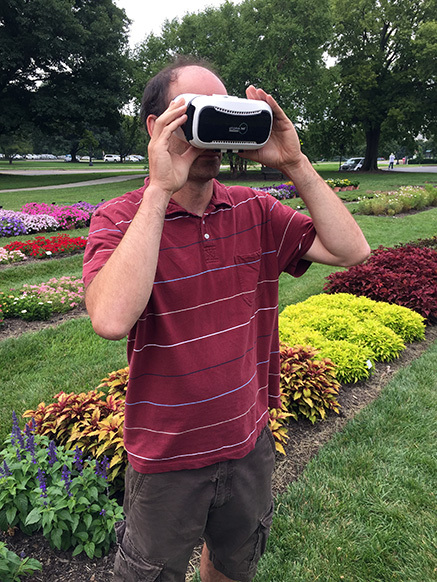 For 2017, a new program is available at the Ohio State University Cultivar Trial garden - a 360˙ panorama tour for anyone who uses a computer, cell phone, tablet or a VR headset. Created by Dr. Tim Rhodus, Professor Horticulture & Crop Science and Ernest Witney, Systems Manager. The trial garden was extensively photographed and incorporated into a virtual experience that provides viewers with not only a virtual browsing experience but also on-screen plant names and corporate logos. A total of 792 photos were used to construct 66 panoramic photographs that combine into a virtual tour offering individuals an opportunity to view 224 different cultivars. An additional set of four spherical images were constructed for viewers with a VR headset. This subset of the trial garden is just a pilot to see how the VR tour-building software handles an immersive VR experience. Viewers can interact with a site map, (floor plan) and select individual beds for viewing. They can also control their browsing using the control bar that can be hidden for an unobstructed view of the garden. Visual enthusiasts will enjoy the fullscreen and autorotation option that allows you to observe the garden on a continuous rotating basis while the “tour guide” automatically advances to the next panoramic scene. Research into alternative cameras, stitching and VR tour building apps has been underway since January 2016 when Dr. Rhodus first introduced his students to VR technology. As part of their course in Interactive Technologies, students created a series of VR images using the Google Streetview app on their cell phones. The tours were uploaded to youvisit.com and linked together to form a tour that was introduced by a personalized video. Developed by Dr. Claudio Pasian and managed by William Barnhill, the Ohio State University Cultivar Trials are conducted each year in order to evaluate ornamental bedding and container plants.